Greek Easter, like many Orthodox religions, is based on the Julian calendar rather than the Gregorian calendar that Catholics and many western churches follow. By following the Julian calendar and adhering to the practices of the early Christian church, it ensures that Easter is never celebrated on or before passover. As a result, the Greek Orthodox Easter often falls later than the western Easter. This means that my own childhood growing up and now with my own family, we can find ourselves celebrating two Easters. 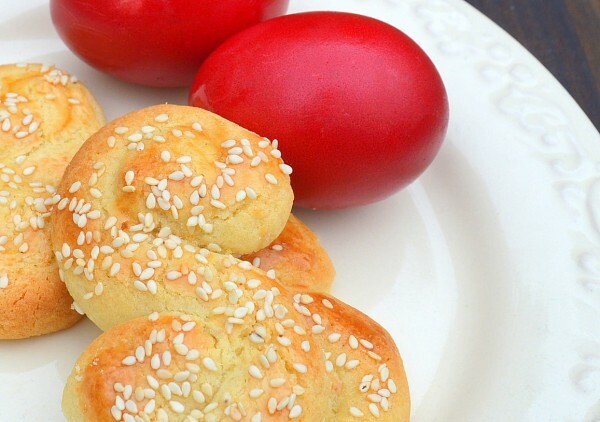 We had planned to celebrate Greek Easter in Greece itself this year, so that the children could get an authentic experience of the celebration in the country itself. Unfortunately, sad circumstances have dictated otherwise so we’ll be marking the occasion here instead. Greek Easter is not celebrated by chocolate eggs and the Easter Bunny. Instead it is marked with a church service and eggs dyed a bright red, followed by plenty of food with lots of family and that’s what we’ll be doing this year. This year it falls on May Day and, weather permitting, we’ll be off to London for the service followed by a family picnic with lots of extended family. 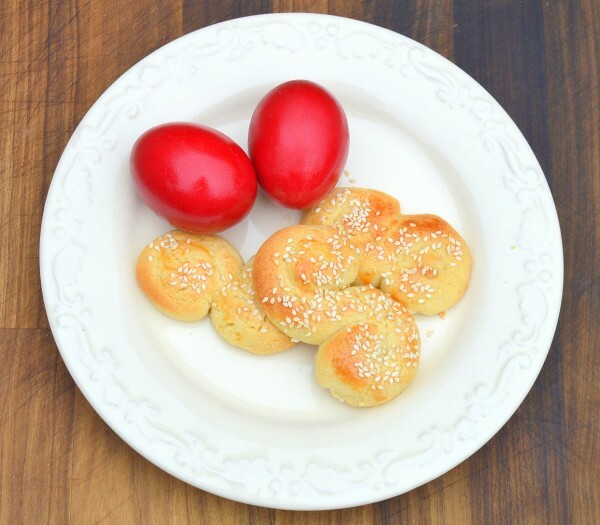 These Greek biscuits, known as koulourakia, are usually made to celebrate the Greek Easter but are so delicious and simple to make that you can knock a batch up at any time of the year you fancy. 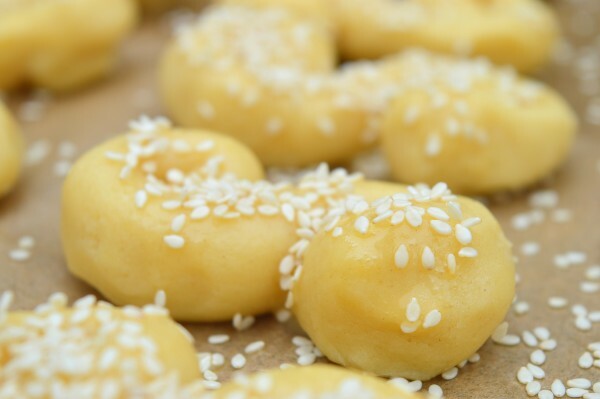 Sometimes you will see them sprinkled with sugar but I prefer to make mine with sesame seeds instead. This recipe makes approximately 60 biscuits so you may want to halve it if you don’t have a family of greedy piggies. Alternatively, they will store in an airtight container for a week or so, so perfect to make ahead of family gatherings or celebrations which may be coming up. Here is the recipe just for you and, as always, don’t forget to pin away as much as you like! Grease baking trays and set aside. Cream the butter and sugar together until pale and creamy. Add the eggs one at a time, mixing through thoroughly. Add the vanilla and almond extracts to the mixture. Sift in the flour and mix together well until a soft dough forms. 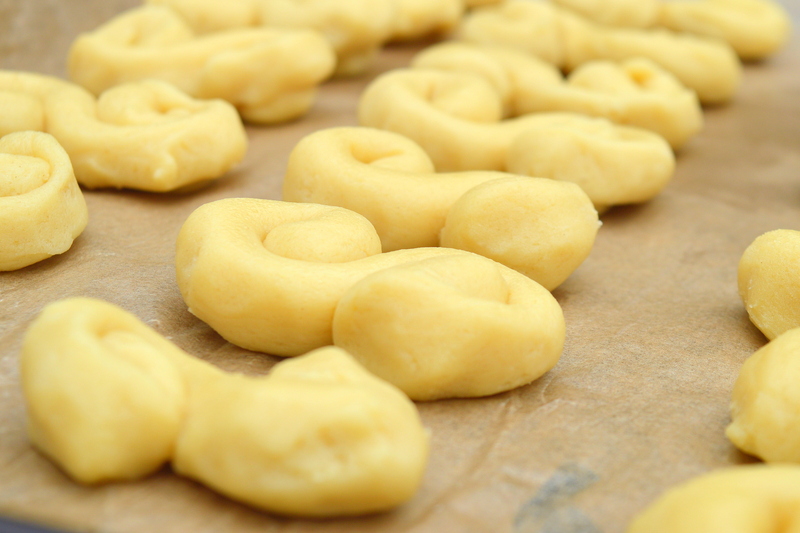 Take a walnut-sized piece of dough and roll into ‘S’ shapes. Alternatively, you can shape them into wreaths or twists. Place each biscuit onto the greased baking tray, leaving a clear space around each. 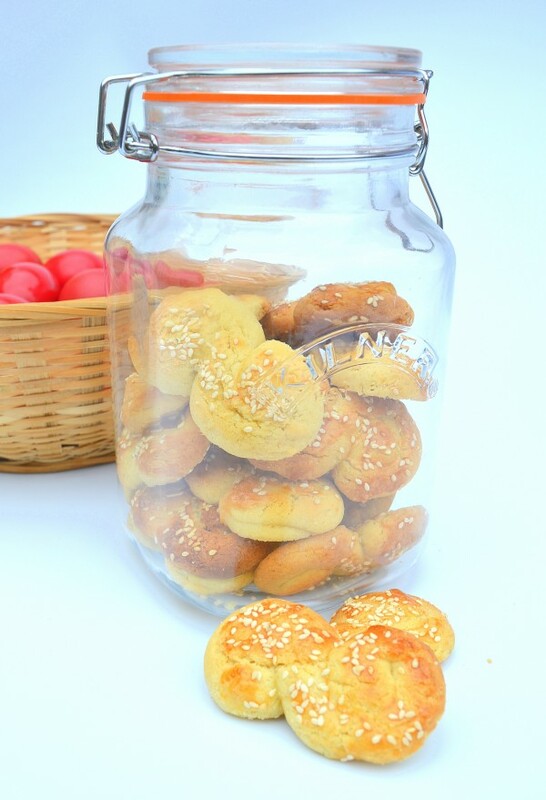 Brush each biscuit with beaten egg and sprinkle with sesame seeds. Bake for 8-10 minutes until golden brown and firm to the touch. Remove from oven and leave to cool on a baking rack. They can also be stored in an airtight container for a week or so. They never last that long in this house though! 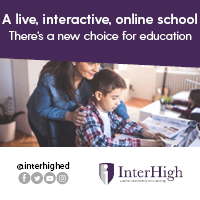 Click here to find more of our recipes and don’t forget to follow us on Instagram for a peek into upcoming recipes. There’s always next year to celebrate in Greece. Thanks for stopping by. Looking forward to linking up again soon.